DEA Bravo Horizontal CMM - CMM Inc. The DEA BRAVO HA and HP Series are heavy duty, high performance, horizontal measuring arms. 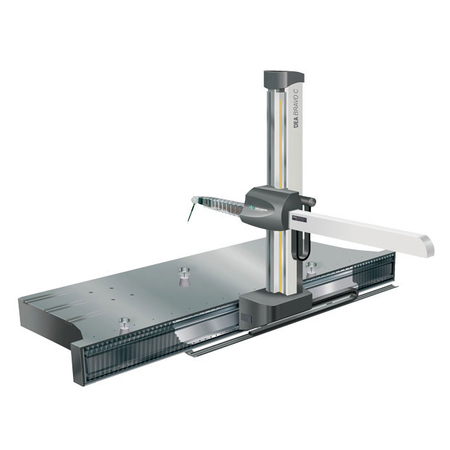 They were specifically designed for on-line dimensional inspection of car bodies, subassemblies, and similar metrology applications. Real-time process control elements relative to speed, accuracy, and reliability, combine with the advantage of reduced maintenance. Advanced multisensor temperature compensation system ensures nominal measuring accuracy over an extended ambient temperature range. Floor flush installations feature easy access with durable walkable covers on X-rails for the floor. Data handling and control systems process point to point continuous scanning applications at various automation levels. Advanced compensation routines eliminate re-calibrations. Use a wide selection of continuous wrists, indexable heads, control units, probes, extra-long extension bars and related accessories for tactile and non-contact inspections. The DEA BRAVO series are available in either single or dual arm configuration.